Shares of Uxin (NASDAQ:UXIN) were catapulting higher last month as the Chinese online used-car dealer scored a partnership with Taobao, the massive consumer-focused marketplace of Alibaba (NYSE:BABA). According to data from S&P Global Market Intelligence, Uxin shares finished the month up 48%. But the stock had more than tripled at one point as trader-driven momentum seemed to push both the stock's dramatic gains, as well as its sell-off as the stock traded on unusually high volume all month. The chart below shows the stock's roller coaster ride in December. The rally started on Dec. 6 when Uxin announced the new partnership with Taobao, saying the two companies would collaborate on areas including business-to-consumer and business-to-business used car transactions, an integrated supply chain, and loan facilitation. As part of the deal, Uxin and Taobao will set up a used car "shopping mall" on the Taobao Marketplace. Shares gained 31% on the news. The stock continued to surge from there, and investors got another piece of good news the following week on Dec. 12 when Uxin said that its new Taobao mall had facilitated over 2,000 transactions in the first 18 hours of the Double 12 (for Dec. 12) shopping holiday. Investors cheered the news, sending the stock up another 24% on a record high volume of 27.3 million shares. Later in the month, Uxin shares began to crash, giving up much of the gains from earlier in the month. There was no direct reason for the sell-off, but the market seemed to have decided that the stock had been overbought, as it's hard for any stock to justify a 250% increase in its value in just two weeks. 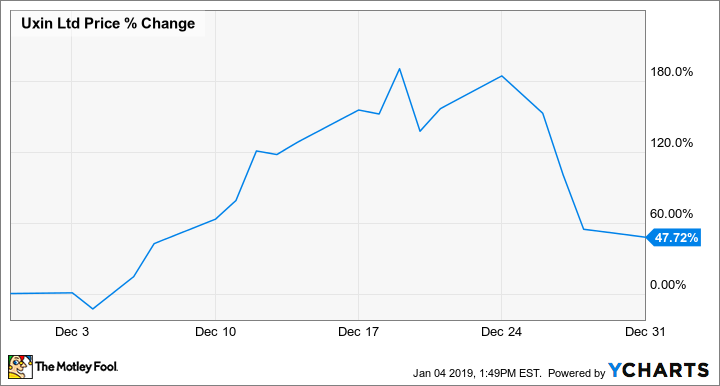 Uxin stock continued to decline into the new year; it was down more than 25% so far this month at the time of this writing, with the correction from last month's surge continuing. As a Chinese stock with blockbuster growth but wide losses, Uxin is a textbook example of a high-risk growth stock -- its business has considerable potential but also a lot of uncertainty. Investors are still struggling to make sense of the company and its prospects, and day traders have capitalized on the opportunity from the volatility. With backing from Tencent and now a partnership with Alibaba, there are a lot of reasons to like Uxin. But the stock should remain volatile over the coming months, at least until its next earnings report comes out in February.